Just as Formula 1 racing leads to improved safety and efficiency for everyday motorists, so the grueling Volvo Ocean Race has given a raft of technical data to Mastervolt technicians to help them further refine electrical independence for boat owners. Some of the figures captured by the ongoing monitoring are truly impressive. Mastervolt, the world's leading supplier of off-grid electrical systems, was chosen as the Official Electrical Supplier to the race, and fitted an identical electrical system into each of the 7 Open 65 racing boats. The company also ran comprehensive technical training for the crews, and manned a 24/7 remote diagnostic service whilst the race was underway, although this was barely required. By the end of the race, each of the boats will have drawn on their Mastervolt systems for around 40,000 nautical miles, with the combined fleet travelling the distance to the moon. The highly efficient, and light weight Mastervolt Lithium Ion Ultra batteries, were able to minimize the quantity of fuel and water to be carried, as each boat only needed to run its generator - a 75hp Volvo diesel driving the two Mastervolt high yield alternators - for 59 minutes every 24 hours. The performance and reliability of the Mastervolt system was mission critical, given no charging from renewable sources was available for backup. When the yachts finally secure in Gothenburg after 9 legs of intense racing, each Mastervolt alternator will have spun 88.2 million times during 21,000 minutes of operation. This will have generated a total of 88,400amps, which deep-cycled the Lithium Ion Ultra batteries around 275 times. The total energy generated by each yacht during the race will be around 1,100kWh. This is a testament to the extreme efficiency of each Mastervolt system, because this energy powered all the lights, the satellite communications and water maker for each crew of 9 athletes, but also supplied high draw items such as the radar and the amp-hungry canting keel. And there was enough energy left to charge up several iPods, phones and cameras! It is hard to imagine a more hostile environment for an electrical system, with constant vibration, hard knocks, salty spray and dripping condensation. Each component still gave reliable performance, with only a couple of very minor adjustments required to reach optimum functionality. One was a poor connection, easily remade, another was a sensor that needed resetting. Mastervolt deliberately made the systems as easy to operate and maintain as possible, as the crew would be more concerned with sailing the yacht than with pressing buttons. It was a policy that paid off, and which also led to some minor changes to future designs. Audible alarms, for example, were toned down and minimized so as not to disturb an off watch crewmember unnecessarily. Mastervolt's technicians will now amass the data from each boat, and compile it all back at their Amsterdam headquarters. The results will help to drive the even greater efficiency of the next generation of alternators and batteries, and of the distribution systems required to eke-out every watt from a 59-minute charge cycle. However, unlike the Volvo racers, of course, everyday boat owners won't be so restricted in their recharge cycle, and will have plenty of power to spare. Commenting on the impact of the race on future designs, Dennis de Beer, Team Leader Application Engineering for Mastervolt, said "The Volvo Ocean Race is the ultimate test of both man and machine. We were very proud to be the Official Supplier, but then our whole philosophy is to develop rugged systems that make the best use of every amp available. When one boat owner at an exhibition asked us if we had vibration-tested our installations, we were able to say they have had the ultimate shakedown - the Atlantic, Pacific, Indian and Southern Oceans. The data we have gained will help us advance the brand for both commercial and leisure applications. 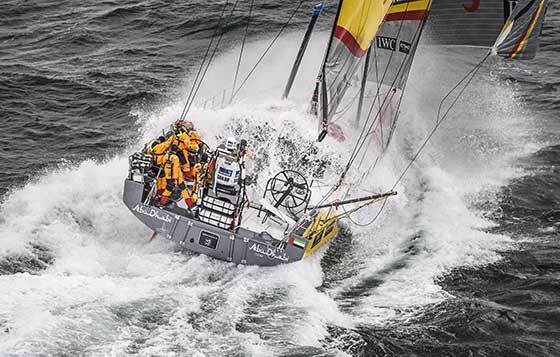 If our systems can shrug off the Volvo Ocean race, then they can handle anything."